The Rio Cucharas Inn offers a delightful hotel nestled within the Colorado Rockies. Our Walsenburg Hotel is surrounded by Colorado's oldest National Park. 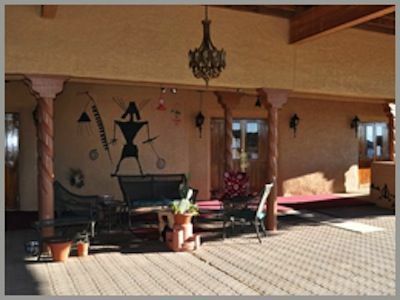 Come enjoy Rocky Mountain hospitality at the Rio Cucharas Inn in Walsenburg, CO. Whether you are planning a romantic getaway, a family adventure or a corporate function, Rio Cucharas Inn Hotel can help you make your trip everything you hoped for. Our Walsenburg Hotel offers well appointed rooms with FREE wifi Internet, room service, laundry service, indoor swimming , Spring and Summer, pool, color TV, refrigerator and microwave. Our professional, well trained staff will cater to your every need and would be delighted to help you plan your activities and assist in making your stay as enjoyable as possible. Lathrop State Park, located 2 miles /3.2 km/ west of the city limits of Walsenburg, is the State of Colorado's first State Park and is over 1,600 acres ,6.5 km2, in size. Two lakes, Martin Lake and Horseshoe Lake offer fishing, stocked by the State of Colorado , water skiing, boating, jet skiing, hiking, camping and is the only State Park in Colorado with a golf course. The nearby Spanish Peaks are a national landmark and named one of Colorado's Seven Wonders by the Denver Post. The Highway of The Legends, connecting Walsenburg with La Veta, other historic mining towns, and Trinidad, is a National Scenic and Historic Byway, The Walsenburg Golf Course is a 9 hole public golf course open for play year round. The City opened a two million dollar water park, "Walsenburg Wild Waters" .